Have you lost some important data on your computer? Ordinary users who do not have much data recovery knowledge, generally have two options to recover lost data. First, turning to professional data recovery companies which is very expensive and second, to use professional data recovery software which functions only if your hardware is not damaged. MiniTool Power Data Recovery is one powerful recovery software program that runs under normal operating system but what really separates it from other photo recovery software is the fact that even its Boot edition can recover lost data from crashed operating systems. When your operating system cannot boot, you just have to start the computer and run MiniTool Power Data Recovery software via boot disk to recover lost data. Simple! I had a similar problem few months back. Just on a night before an important meeting, I accidentally deleted the presentation I had to speak on the next day. Now, if you are working in a multinational company and your entire team depends on you, you know you will be screwed. I immediately panicked as my operating system didn't boot and called a friend who told me about this software. I used the Bootable Media Builder to create the Power Data Recovery boot disk, successfully recovered my presentation, thanked God and decided I have to tell my readers about this amazing discovery. Continue reading the article to know more. There are so many functional defects in the recovery software available in market and thus one needs to be really cautious when choosing one. MiniTool Power Data Recovery Boot Disk is as powerful as the Windows edition Data Recovery software in terms of functioning. The boot disk can be started through both CD/DVD & USB flash drive. Thus, if your laptop does not have a CD/DVD driver, you can use USB flash drive which all modern devices have. Let me demonstrate how I recovered my deleted presentation by creating this powerful Power Data Recovery Boot Disk. To recover the lost photos, first visit the official website of MiniTool Power Data Recovery or photo-recovery.biz and download the boot files. Then, you will have to burn it into USB flash drive or CD. 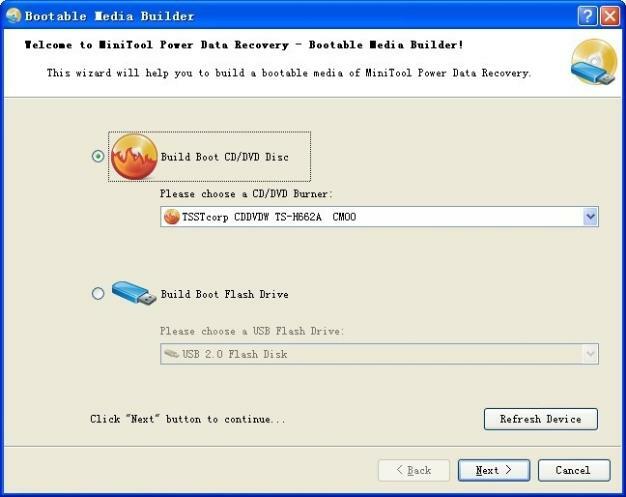 How to create a MiniTool Power Data Recovery Boot Disk? 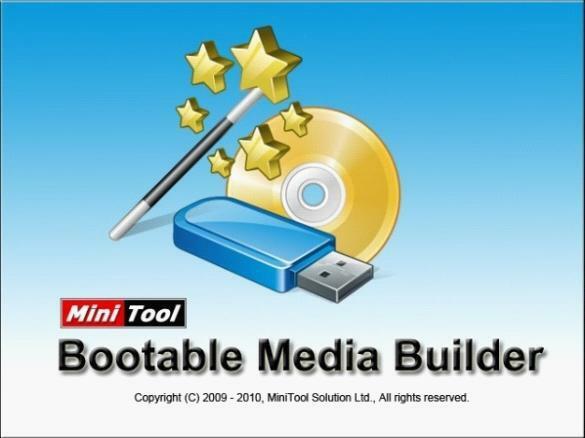 MiniTool offers a special program called Bootable Media Builder which allows you to create MiniTool Power Data Recovery Boot Disk easily. Just run this program on your computer and you will see the following interface. If you want to create a Bootable CD/DVD disc, select Build Boot CD/DVD Disc option in the main interface and then choose a suitable CD/DVD Burner from the device list. If you choose ISO Image Recorder, note that the will create an ISO image file for the CD. Then, click 'Next' button to proceed. Here, I have selected CD/DVD Disc but if you want to make Data Recovery bootable flash drive, just select the Build Boot Flash Drive option. You will be able to see a flash drive list if you click on the arrow in the box. Choose the suitable flash drive from the list and click 'Next'. As shown below, a dialog box will pop up. Now, note that your selected flash drive gets formatted by Bootable Media Builder and all data on the drive gets destroyed so only if this data is useless click 'Yes', else click 'No' to stop the operation then & there. If you proceed by clicking 'Yes', the builder will generate all the related boot files on this drive. Usually this process finishes quickly. It took only 3 minutes on my computer but this will depend on the speed of flash drive & USB interface you use. After this, you can unplug your flash drive. 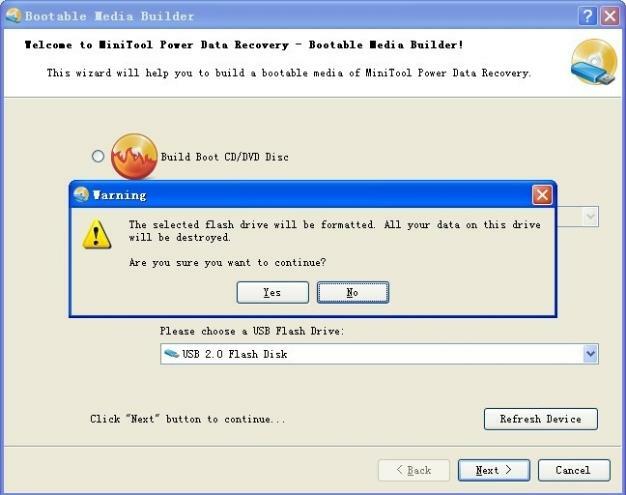 You have successfully created a MiniTool Power Data Recovery bootable flash drive. After the boot disk is started, you will see the main interface of the photo recovery software which asks you to choose a module to start recovery. The MiniTool Boot Disk supports four data recovery methods or modules: Undelete Recovery, Damaged Partition Recovery, Lost Partition Recovery and Digital Media Recovery. 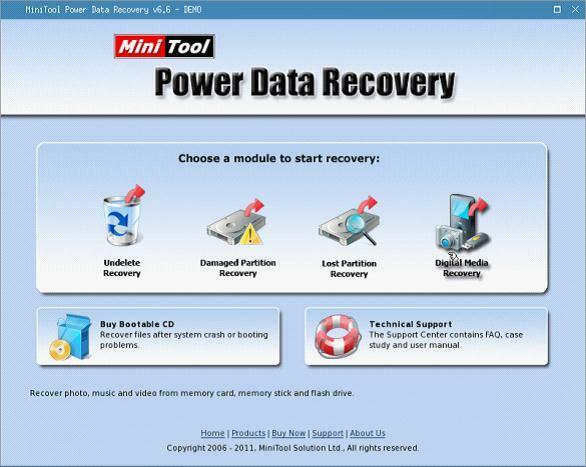 A fifth one CD/DVD Recovery module is provided in the MiniTool Power Data Recovery software but not supported by the boot disk. When your disk or operating system is crashed, the disk can recover data using any of these four modules. Since different factors lead to data loss, users must use different modules to solve the corresponding data loss problems and meet a good data recovery success rate. Let's discuss each in brief. This is the first module shown in the interface. It allows you to recover files that are deleted using Shift+Delete and those that are emptied from the Recycle Bin in Windows OS. It supports NTFS & FAT systems. As you click the module, you will see the following interface. Now, select that partition which had the deleted data originally and click 'Recover'. Scanning process will start and you will see the following interface. Go back to the selected partition and check if the data is recovered. It must be. So, click 'Save Files' next in order to store the data to a safe place by following the software prompts. 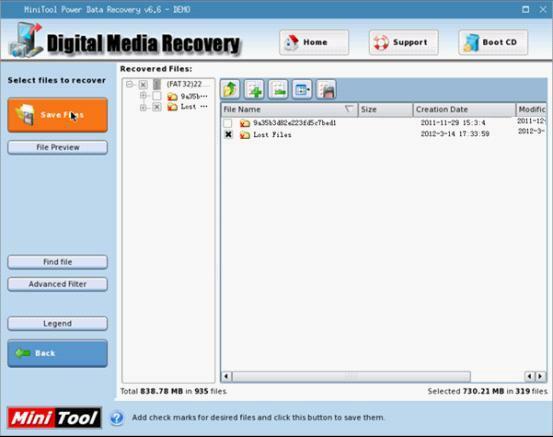 Don't save this recovery software or recover data to a partition that is suffering data loss. As, I experimented more with this product, I created a new folder by the name of Testing. Then, I copied a video file from a folder and pasted it in the Testing folder. To test the module, I deleted this file using Shift+Delete (permanent delete) and then switched over to the boot disk. Voila! It worked. It was so easy to recover the file and save. 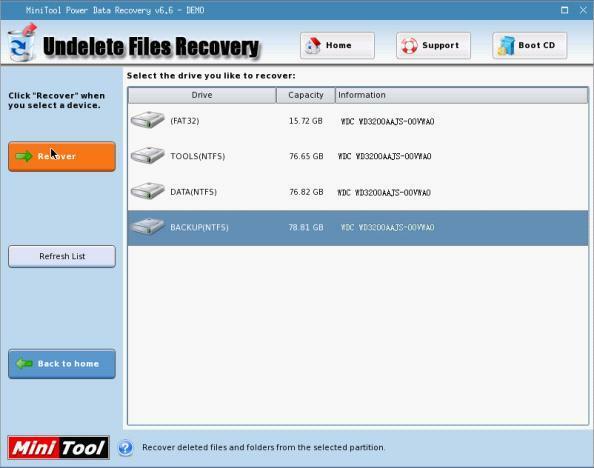 This module allows you to recover lost data from damaged hard drives & formatted drives. This is the MiniTool's most powerful module and in case, you are unable to recover data from the Undelete Recovery module, this module may help. An easy to understand guide on how to recover files from damaged hard drives is provided on the official website of Power Data Recovery. Though the company claims that Damaged Partition Recovery is the most powerful module, in some cases if it doesn't work, you can try your luck with Lost Partition Recovery. This module helps when the user has lost data because of deleted or lost partition due to damage or loss of partition management information such as file allocation table. It has two scan engines- quick scan and full scan to recover lost data from repartitioned disk, corrupted MBR and crashed HDD. The quick scan should be able to detect the data but if it fails, try the full scan engine. This module specializes in recovering digital media. If you lose your media, Digital Media Recovery should be your first choice. It focuses on a list of formats mentioned on the company's official website. It recovers media from MP3 players, flash drives, video cameras, digital cameras, memory chips & even iPod. Though there are many data recovery software available in market, the boot disk has its unique benefits. If your operating system can't boot, there is no need to reinstall it as data can easily be recovered by the disk. It supports data recovery from many different file kinds including the commonly used FAT12/16/32, NTFS and HFS+. It supports recovery from diverse storage devices including SSD, mobile hard drive, USB flash drive and memory card. The list of file formats supported is given on the official website of MiniTool and it seems unending. As the disk software is similar to MiniTool Power Data Recovery in terms of page layout, this can realize a satisfying data recovery effect. MiniTool Power Data Recovery Boot Disk proved to be very useful to me and I would say that it is a must have data recovery solution when your computer cannot boot. For more information, visit PowerDataRecovery.com. I have used this application plenty of times to recover different types of lost files. Occasionally, when it is unable to restore few information, Remo Recover offers satisfactory outcome in simple clicks.